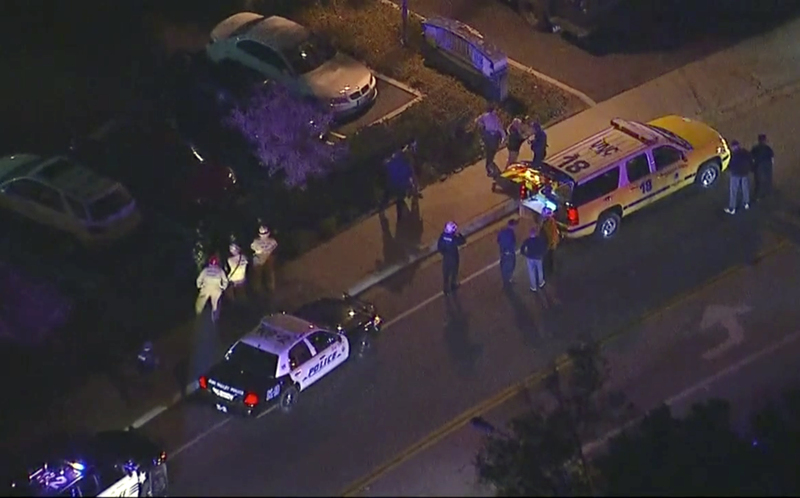 LOS ANGELES (CN) – The gunman that killed a dozen people inside a country music bar in California three weeks ago does not appear to have been radicalized by any extremist group and had no violent interaction with police in the past, law enforcement officials said Tuesday. Paul Delacorte, assistant director of the FBI’s Los Angeles field office, said at a news conference in Thousand Oaks that no motive has been determined for why 28 year-old Ian David Long, a Newbury Park resident and former U.S Marine, fatally shot 11 patrons and a Ventura County deputy inside the Borderline Bar and Grill on Nov. 7. Ventura County Sheriff William Ayub said Long had only a few contacts with police in the past, including two traffic-related incidents, and had never been arrested. Long was the victim of a battery at a different local bar in 2015 and had sent a sexually inappropriate text message to a girl in 2008, but no criminal investigation was launched, Ayub said. In the most recent interaction with police, this past April, authorities were called to the home Long shared with his mother after neighbors heard loud bangs and screaming. Ayub said Long was evaluated at his home by county health staff who determined he didn’t meet the criteria to be involuntary held in a mental health hospital unit. Ayub said there was no evidence that Long was targeting a girlfriend who he believed to be at the bar during his rampage. Investigators are combing through evidence from the event, including Long’s social media account, where he posted updates during the shooting. Over 400 people have been interviewed by authorities, including Long’s friends and family. Ayub said Long drove to the bar, entered the building just after 11:20 p.m., and “immediately started shooting,” eventually firing over 50 rounds from a Glock .45 semi-automatic pistol that had a flashlight and laser guide attached to it. Long threw smoke bombs across the bar, building the chaos and frenzy that led over 100 patrons to flee, including by breaking down the bar’s glass windows to escape the shooting. Some patrons even hid in the bar’s attic. Ayub said Long then prepared for a police response by getting into “a position of tactical advantage” from which he ambushed Ventura County Sheriff Sgt. Ron Helus and a California Highway Patrol officer who had also responded to the scene. Helus was killed in the shooting. Long, who didn’t have a concealed carry permit for the pistol, also had seven high-capacity, 30-round magazines, five of which were still fully loaded, Ayub said, adding that Long legally purchased the gun in August 2016 at a gun shop in neighboring Simi Valley. Ayub said that while the magazines are illegal to purchase or possess in California, they can be easily purchased in neighboring states. Long had a folding knife in his possession but no other weapons were found in his car or at his home. Twelve people were killed in the shooting plus the gunman, who killed himself, according to authorities. Several of the bar patrons, including one of the shooting victims, Telemachus Orfanos, survived the 2017 mass shooting at the Route 91 Harvest music festival in Las Vegas. Borderline Bar had become a meeting point over the past year for survivors of that incident living in the area. A 13th victim who was shot survived after being treated by doctors. “Our hearts are with the victims and their families and share in their grief,” Sheriff Ayub said, adding that all information from the investigation was first shared with victims’ family members. Dr. Christopher Young, the county medical examiner, said there was no information that any of the victims were struck by bullets fired from the rifles of the two officers who responded to the shooting. Young also said there was no evidence that the victims could have survived if police responded any sooner than they had. Ayub said the investigation is ongoing. “There is still much, much more to do,” he said.